White Wolf : 6 Truths to understand the Sacred Meaning of Hair For Native Americans. 6 Truths to understand the Sacred Meaning of Hair For Native Americans. 1- For most Natives, hair was only cut under certain circumstances… Many Dine, or Navajo, cut children’s hair on their first birthday and then do not cut it again… Among some tribes, hair was cut as part of tribal mourning customs… You can imagine how it must have felt for many native children to have their hair cut against their will upon entrance into U.S. government-run boarding schools. The physical cutting of hair is a manifestation of the loss of a loved one, a loss of a relationship, and a loss of a part of self. 2- Many folks want to know what Native American hair styles looked like in the old days. There is no single answer to this question. Typical hairstyles varied from tribe to tribe, but in most tribes, individual Native American people also wore their hair differently from one another. So just as there isn't really an "American haircut" today, there wasn't really a "Blackfoot haircut" then. Different American Indian people chose different hairstyles based on a style that was popular in their particular band or village, a style that identified them as members of a particular clan or society, a style worn by an older person they admired, or just a style that they thought looked good on them or suited their personality. Some of the styles that were popular among Native Americans looked pretty different than the styles that were popular with Europeans, though. 3- Women's Hairstyles: The most common Native American women's hairstyles were a simple flowing hairstyle (either with or without bangs) or long braids (either two braids or one single braid.) Some women painted horizontal stripes on their hair or dyed the center part a bright color. In the southeast, many women from tribes such as the Creek and Chickasaw wore their hair on top of their heads in buns or topknots. In the southwest, women from the Navajo and Pueblo tribes often wore their hair tied behind their heads in a kind of twist best known as a chongo (the Pueblo word for this hairstyle.) Other Southwestern Indian women preferred to keep their hair cut to shoulder length. One distinctive tribal hairstyle for women was the elaborate squash blossom or butterfly whorls worn by Hopi maidens. To make this hairdo, a young woman's mother would wind her hair around a curved piece of wood to give it a round shape, then remove the wood frame. Only unmarried young women wore this complex hairstyle. Another unique tribal hairstyle was the board or bonnet hair popular among Seminole women in the 1800's. Seminole women made their hair into this disk shape by fanning it over a tilted cardboard frame (which then stayed in place under their hair.) Traditionally, most Seminole women wore their hair on top of their heads like other southeastern Indian tribes, and today the black board style is almost never worn. However, it can still be seen on Seminole palmetto dolls, which are usually made with this distinctively Seminole hairstyle. 4- Men's Hairstyles: The most common Native American men's hairstyles were flowing hairstyles, long braids, or shaved heads. But there were many different versions of each of these basic hairstyles. Hair held great symbolic importance for men in many Native American tribes, especially in Western tribes like the Lakota and Blackfoot. Men in these tribes only cut their hair to show grief or shame, and often wore the front part of their hair in special styles including pompadours (hair stiffened with grease or clay so that it stands up), forelocks (one long strand of hair hanging down between the eyes), or small braids or topknots arranged in various shapes. In Eastern tribes like the Lenape and Iroquois tribes, most warriors shaved their heads except for a scalplock (a single lock of hair on the crown of their head), tonsure (a fringe of hair around the head), or roach (a stiff crest of hair running down the middle of the head.) The roach hairstyle is often known as a Mohawk or Mohican hairstyle, after two tribes who frequently wore it. Native American men would often wear artificial roaches, too, which were made of brightly colored porcupine or deer hair. Men with shaved heads and men with long braids would both wear artificial roaches sometimes. Most Southwest Indian men originally wore their hair in a chongo style similar to the women's. (Chongo is a Pueblo word; the same hairstyle is also known as Tsiiyéél in Navajo and Hömsoma in Hopi.) Shoulder-length hair with a cloth bandana around it became a more popular style in the Southwest by the 1800's. Other Southwestern men twisted their hair into long hair rolls resembling modern dreadlocks, which they stiffened with clay and painted. On the Northwest Coast and northern California, men sometimes wore topknots on top of their heads. Northwest Coast men also wore mustaches and sometimes beards, while men in most other Native American tribes kept their faces shaved. 5- Do Native Americans still wear these hairstyles today? Some of them. 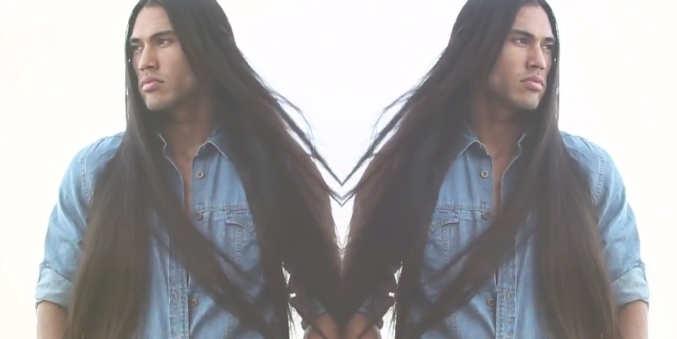 Braids and long flowing hair are still popular hairstyles, especially among women, but also for some men. 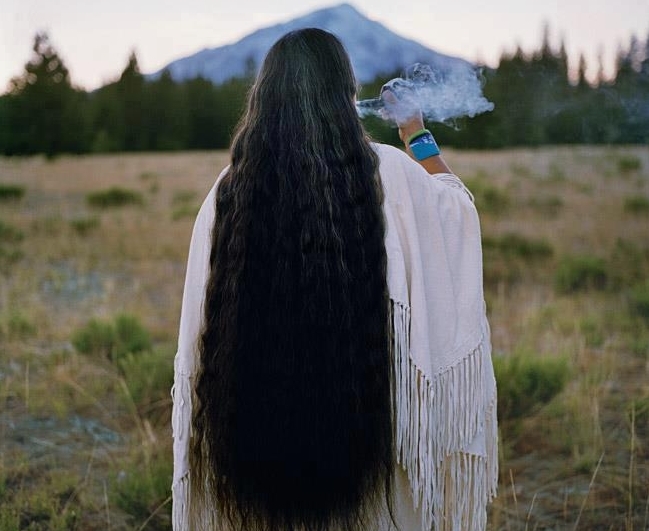 Native Americans in some Plains and Western tribes continue to place great spiritual value on their hair, cutting it only when they are in mourning. Chongos are still worn by some Native American women in the southwest. Other special hairstyles like forelocks and squash blossoms are seen only at religious and cultural events. The roach ('Mohawk') hairstyle is almost never worn anymore, but artificial roaches are still worn at powwows all over the country. 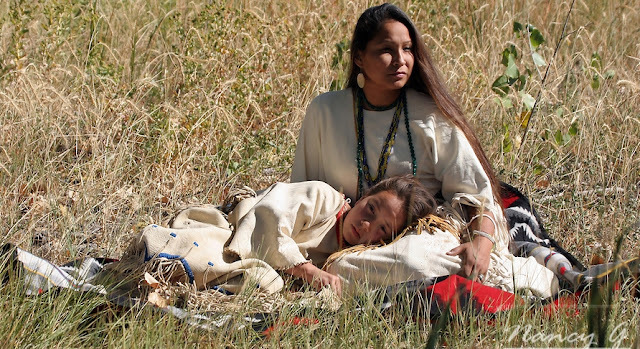 6- Why Do Native People Have Long Braided Hair: In some of the Native American Indian tribes, knowing how to braid hair was an essential part of their life. Wearing braids could signify the status of someone in the tribe. Sometimes, only the medicine man or chief could wear braids. Other times, young warriors would braid their hair and adorn the plaits with feathers, beads or leather. Still, for some tribes of Indians, only the women could have long hair, so they were the only ones who could braid. 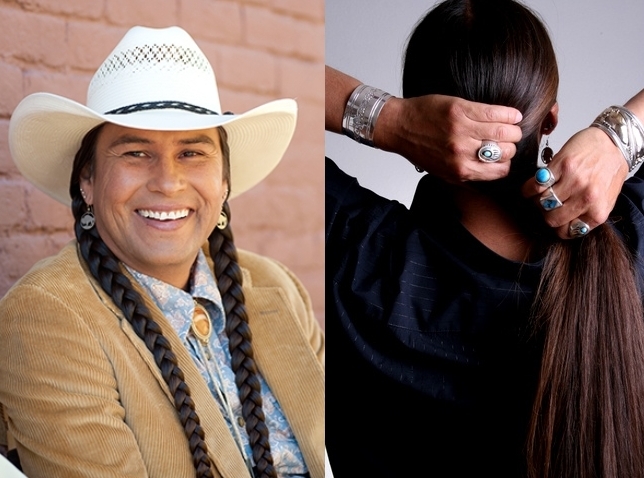 Responses to "6 Truths to understand the Sacred Meaning of Hair For Native Americans." Long hair is a symbol of one's strength...Ahehee. Much of what is said here, applies to the people of the Marshall Islands. I thought native Americans weren't able to have beard because of their asian genes. Reply to Thijzzemans : this culture of people are Native Americans & deserve our utmost respect. You mentioned Asian...that's an oxymoron! Asians & Native Americans are two  separate cultures.